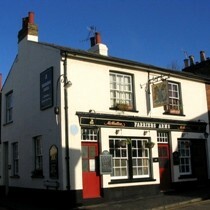 The Farriers Arms is a traditional back street locals pub about 5 - 10 minutes walk from St Albans city centre. It is owned by McMullens brewery and therefore serves AK, Country and the new McMullens Cask Ale on handpump. The first branch meeting of the Campaign for Real Ale was held in the Farriers Arms. Fairly small interior with outside toilets. TV showing sports events. At the time of the review we found this to be a not very welcoming and a rather basic pub. "The Farriers Arms, a nice, quiet, well-run, traditional English pub is the pub in which the local CAMRA branch was founded in 1972. It is tucked away down Lower Dagnall Street, about 5/10 minuets walk from the town center, run by owner and landlord Tony and his wife Janine, with the help of full time barman Garry, you will find perfectly kept McMullen’s ales on the hand pumps, and excellent bar food. Fairly small inside you will find a warm welcome with open fires in both bars in the winter, the Farriers Arms is everything you could possibly ask of a traditional English pub. If you are into sport then this is the place to enjoy a perfect pint whilst watching the rugby or cricket with the locals, I can thoroughly recommend it." "The first review is correct as far as the description of the premises, but not, IMO, about the pub's character. It is a "back-street" pub; there are no games machines, but there are tellies usually tuned to sport. No background muzak (hooray!). It is not a "pulling pub" nor is it stuffed with flash decor and fittings - it's what it says on the tin - a pub. As for being unfriendly - are we talking about the same pub? I've been there off and on for 15 years or more and despite now infrequent attendance, I'm always greeted by Tony and Janine (and Gary always responds to a greeting). Newcomers I've taken are also chatted to. It's a place where you can be friendly and join in or keep to yourself without being pestered. The age range does tend towards the middle-aged plus, but not exclusively - age is not a factor for enjoying decent beer and friends' company. The clientele varies from session to session, so maybe the reviewer was unlucky. Food is good value. Janine shops and cooks herself and the ham, egg and chips for £6 is damn good value. she also takes pride in the quality of the fish that's served. Sunday lunch needs to be booked. Outside, at the back, is a small smoking area and the loos. Outside loos are unusual, but functional and clean and don't pong."